As a Diet-to-Go Brand Ambassador, I am occasionally given the opportunity to promote things that they have going on. In exchange for my promotion of these items I am being compensated, but all opinions are my own. January is a HUGE month for Diet-to-Go and they are hosting a big giveaway to get you on your way to any healthy living goals that you may have for the New Year. Lots of people use the beginning of the new year as a way to try and get their exercise and healthy eating on track or try to lose weight to meet their weight goals, and Diet-to-Go is here to help! 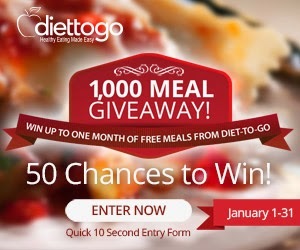 You can win up to one month of free meals from Diet to Go. - 5 winners will receive one months worth of free meals. As you can see, there are a lot of opportunities to win. I have loved my experiences with Diet to Go in the past, and definitely I recommend trying them out as well, because it is healthy, convenient and delicious. And what better way is there to try them out than to win the opportunity to try them for free? 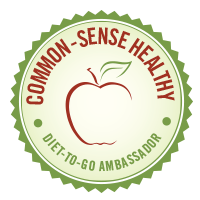 There will be prizes given away during the twitter party and a discount code for Diet to Go products offered! Interested in being a winner? Make sure you enter!